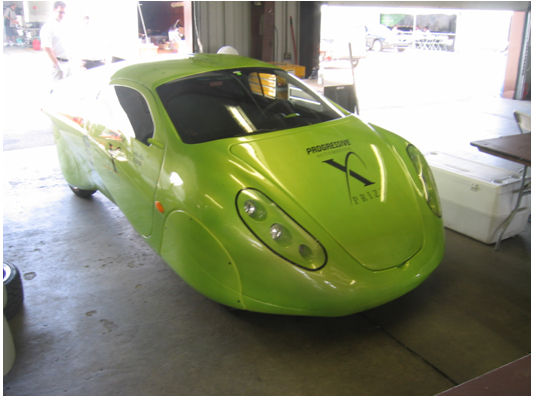 The intention and purpose of the Progressive Automotive X-Prize could actually not be higher� to simply see who could produce a vehicle that could achieve a 100mpg rating without cluttering up the atmosphere with noxious gasses. And this is about efficiency. Who could produce the highly efficient vehicles? Can vehicles exceeding 100 MPGe actually exist? YES and you’d be surprised. Another special aspect of this competition is that it was totally open to any and all comers. It was not limited to any particular type of vehicle so that cross comparisons were possible and hence “the best man” could win without encumbrances. In setting up the competition 3 categories were established that were a bit unusual. Horsepower or passenger count played no part in the winning formula. It was acknowledged that Speed was important and would serve as the final arbiter in the case of a dispute. The Mainstream Class was for vehicles that were of standard 4 wheel configuration with side by side seating. Surprisingly, only one of the many entries in this category finished. 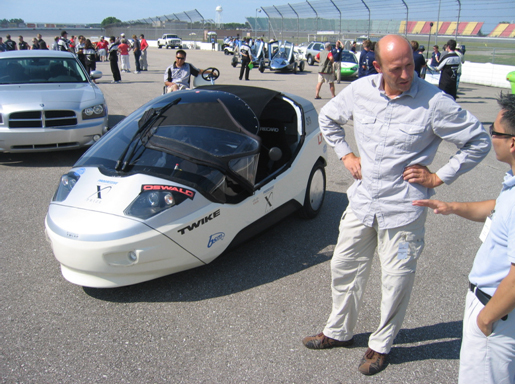 No production vehicle could achieve the MPG goal and only one of the experimental vehicles could pass all the tests. The Tandem Class was for in line vehicles seating more than one. Two entries, and only one early on. The Side-by Side Class was as it states seating wise and allowed for alternative configurations. 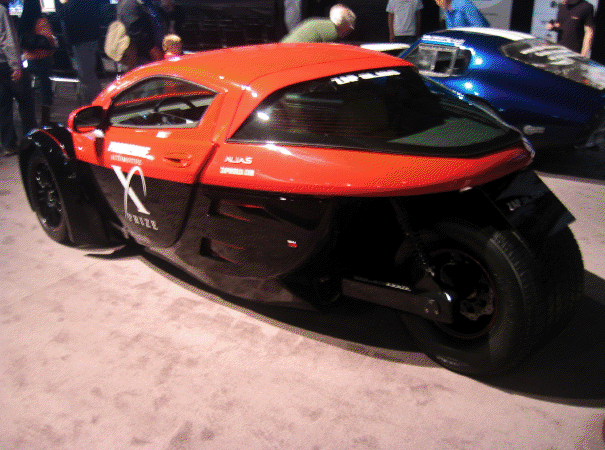 This is where the three wheeled vehicles showed up along with unusual configurations. 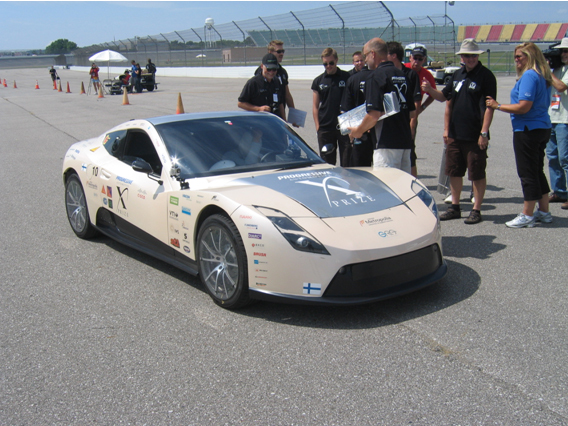 Tests were developed and the competition was held at the Michigan International Speedway. 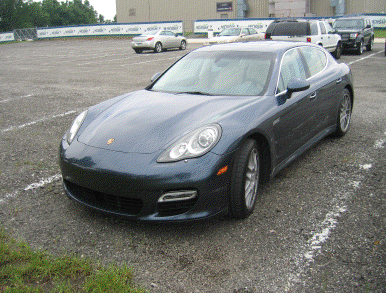 There were acceleration and braking tests, speed tests, emissions tests, and collision avoidance tests. (This seemed to be the perfect venue and it is also where I saw a HPV competition where a Moulton set the world record speed for cycles.) And the tests were given more than one time. Nothing can be so heartbreaking as to see a driver unable to pass one of the tests particularly on the last set. I tend to believe that this completion was far more important than what many may think. Certainly the main automotive writers shied away and showed little interest. Was this a mistake? I think so. My architectural experience was about competitions. Give a simple problem, pull in the many solutions and analyze them. Quick ones were called charettes and this tradition and teaching technique was developed at the Ecole des Beaux Arts in Paris in the 18th Century and continues to this day. Nothing more quickly shows the richness and comprehensiveness and innovation in thought as this technique. It produces real winning advancements. I was astonished to see such little interest except on the final day when many writers and their camera men showed up. Only the Canadian Discovery Channel covered this in depth. They were here in force for every day of the competition and I would hope that when they have their final product that we can see it. I would urge Progressive to make sure that we have the contacts properly set up for that. There is no question that they had the best total coverage. No, there was no dramatic race but there was a fleet drive by on the final day which was both happy and sad. That because some of the vehicles could not make the grade. It must be said that the young engineer, Eric Cahill who established the competition procedures, did a brilliant thing and the staff that was established were as wonderful as it gets. One of the contestants mentioned that efficiency is the most important thing of all and indeed it is. There are efficiencies in body shape and configuration and efficiencies in suspension and efficiencies in power development and power transmission and efficiencies in comfort and ergonomics. The final conclusion that is suggested in this competition is that the day of the fossil fuel powered vehicle is surely on the wane and that electric powered vehicles offer so many advantages that it will be increasingly hard to justify their continued development. To be sure Heavy Duty Vehicles will be fossil fuel powered, but passenger cars can be easily accommodated by battery-electric power. The astonishing efficiency of the Monotracer (Renamed X-Tracer for the competition), of around 200 MPGe, and soon to be available in the US will give pause as to what’s really needed to transport people and daily goods around. And it is the most beautifully designed and executed vehicle in the competition. Since the competition was clearly about Mileage and to see if vehicles could be produced that would exceed 100 MPGe, we’ll consider the vehicles in efficiency order, not by category order. Tandem Class winner, $2.5 million dollars. X-Tracer Team Switzerland “E-Tracer (Winterthur, Switzerland) AKA, Monotracer. 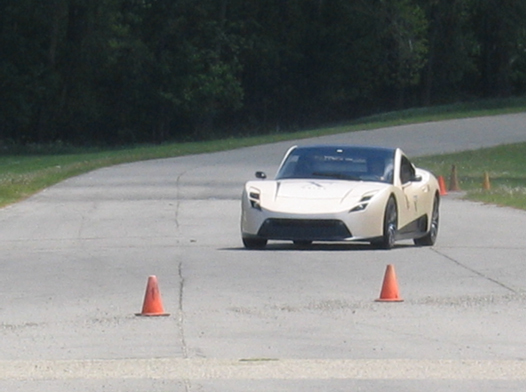 There were no other vehicles in the finals in this class. 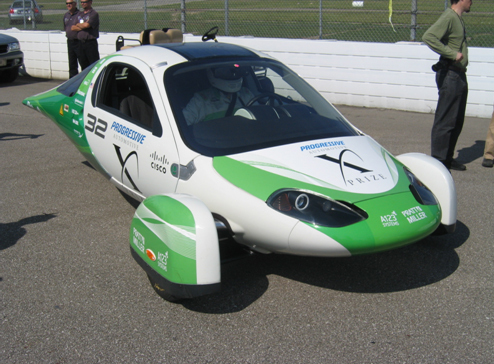 The X-Tracer was in fact the overall winner of the search for efficiency with its mileage rating of over 200mpg. And it was the most beautifully finished vehicle of all having been under development for some 20 years. Those proud that they have an Orange County Motorcycle; now have a step to go. There are two versions, one powered by a BMW motorcycle engine and the new Electric Powered Version. This is a dream vehicle fit for TRON but far too expensive for the middle class. It has been developed by a retired pilot in Winterthur Switzerland. Manufactured by a highly efficient mainline manufacturer the price could probably be cut in half or more. 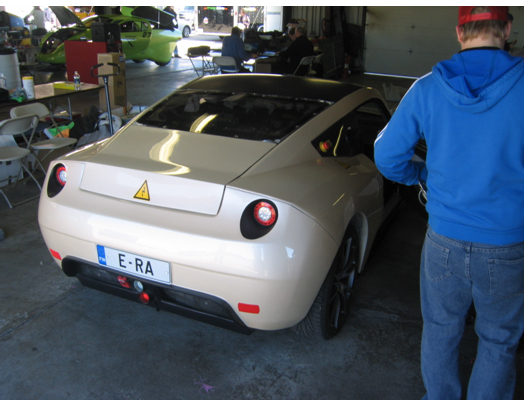 The Electric version is going for around $100,000 while the gasoline powered version sells for around $80k. What fun this is! If you have money to spare, why not have one? The long wheelbase gives a nice ride and it actually is fun on turns because you feel comfortable in the lean which looks extreme but actually works well. The only missing is a tad more ventilation and a tinted set of windows. I’d bet that the sound system sounds wonderful. Traveling would be a joy. Top speed was mentioned as important and this vehicle took the cake in that area traveling in the range of 180 mph. It should be noted that this is a production vehicle ready for purchase now in the Western Hemisphere in both Canada and the US. The X-tracer is proof of concept outriggers and all. The X-Tracer in the Collision Avoidance Test. Unusual? You bet, but awfully nice and when the snarky Automotive Critic from TIME mag selected the worst automobiles of all time he included the Scripps Booth Bi-Autogo which had the first V-8 engine produced in the US. He made fun of it unthinkingly, but it took a lot of engineering advancement to finally make it go some hundred years later. The concept is exactly the same. Don’t you just hate wise arse comments and opinions from people who do not know what they are talking about? 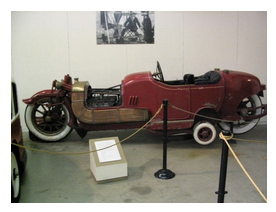 If you get to Detroit you can see this marvelous vehicle in the Detroit Historical Museum. It’s Magnificent, just like the Magnificent Men in their Flying machines. It took Henry to make the V8 the desired engine configuration for well over a half Century and oh how we love them even to this day. The Dream Cruise is about the sound and flash of a Century of Automobiles and it is laden with V8’s and their marvelous, masculine sound. Li-ion Team, North Carolina, $2.5 million dollars. The efficiency of this vehicle is astonishing since it was the best performing 4 wheeled vehicle in the Competition. It deserves a long hard look by the American Automotive Industry. How is it that this configuration could perform so well? There are several interesting facts about the Li-Ion that interest me. I must confess as to disliking several of the design motif ideas, such as the lamping of the vehicle and the way certain ridges were incorporated into the design. The rear wheels appear to essentially be casters since this vehicle had a full belly pan which rose from the front to being quite high in the rear. The frontal area of the vehicle was much larger than that of the Li-ion, closer to that of a normal American small Car, hence belying the notion that an efficient vehicle needs to be diminutive, yet it’s economy was 83% greater. That is not to be ignored. And the interior space of the vehicle appeared to be quite large which implies that it actually could accommodate 4 passengers. Surely the aerodynamics of this automotive vehicle was the best of all 4 wheeled vehicles and the 3 wheelers. There is a recent article about Ed Wellborn, the chief designer of General Motors and his involvement with a streamliner some years back and he mentioned that he always checks the aerodynamics on a new design. He really should look at this vehicle seriously to find out why it performed so wonderfully well. Something special is going on here that needs to be investigated by the serious folk in the current industry. Clearly, neither Ford, nor GM, nor Chrysler has the knowledge to generate such great performance. And surely they have very talented designers who could make this approach sing. Here you see the idler wheels and the possibility of a spacious interior. And you see the small idler wheels. This envelope clearly would be a great candidate for 8 wheels for astronomical efficiency. Following is also a front view with faired in front wheels. It does look a bit clumsy in its modeling and clearly the front lamps do not have a professional flair and the extra groves and ridges may be unnecessary or more deftly executed but you can see that this is no diminutive vehicle. Evidently enclosing the wheels is very important for efficiency. And it reminds one of the vehicles that Batman drove in the early days of the Comic Books. When the competition was underway we were not allowed to see the data, and had we been able to I certainly would have been all over this vehicle. We were left to conjecture. When the final results were in what a pleasant surprise this was. This vehicle may actually have the most to contribute to the future of automotive design hence its presence must be studied and be taken very seriously. There were 3 three wheeled vehicles in the competition and they performed fairly well form a mileage perspective. But it must never be forgotten that they are inherently unstable and no mature suspension engineer in the commercial automotive industry would ever consider such a configuration. It is argued that they have less rolling resistance but in fact bogied 8 wheel vehicles have the greatest stability and the least rolling resistance. This is simply borne out by taking a quick look at a rail car. They all have 8 wheels and if that doesn’t convince you build 3 models of 3, 6 and 8 wheels and place them on an inclined plane and let them roll and measure the travel. You will see that the 8 wheeled vehicle will travel astonishingly farther. 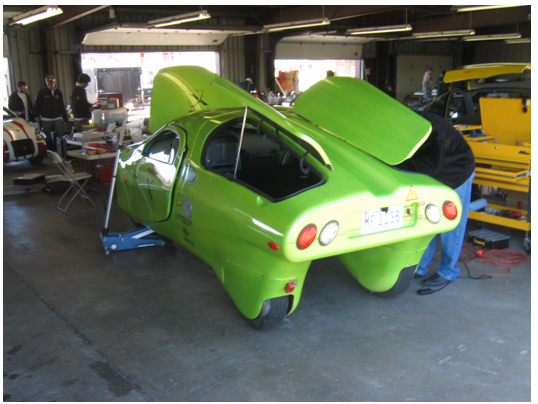 On Tuesday October 5th it was announced in the Detroit News that Borg Warner parts were used in the Aptera and the Li-Ion and that the Aptera was planning on production in Grand Rapids of a 4 wheeled version. They are serious and adjusting to 4 wheels shows that. Looking for all the world like something that Burt Rutan might have designed is the Aptera sans a pair of rear outriggers like the Edison’s. The coachwork is smooth and slick and obviously slippery aerodynamically. This Vehicle is nicely executed. Its Aerodynamic efficiency is reflected in its mileage. This little cutie is out of Germany and is the closest thing that you will ever get to seeing a Dodgem on the highway or a Star Wars golf cart. Here the front wheel is alone. I watched it go up on two wheels in the collision avoidance test… front and left rear. Hate to see a novice do that. This was one of the lowest vehicles and in order to get in and out the side window has to be elongated in order to kick your leg out. I imagine that lots of guys would love that just as they did with the rear hinged Model A. Nice efficiency but dangerous. This beautiful little sports car is out of a Technical University in Helsinki Finland. It strongly reminds me of the Mazda Miata and there just seemed to be something right about this vehicle. The team or Association as they called it was made up of a professor and a large group of engineering students. It is beautifully designed and quite conventional looking with a Swedish flair reminiscent of the Saabs. I have some trouble understanding just why it was not considered to be a mainstream contestant because it surely would have been the winner by a wide margin. It looks like it could go into production immediately and would sell very well, surely competing strongly with the Tesla. Notice the discs over the “rims”. All quite nice. Since the Zap and the Aptera come out of California it’s interesting to see the different interpretations. Here we see something out of Hollywood fit for a movie like Tron. Mean and aggressive it is fun to look at but it is of less efficiency because of its bulky front end. There is no question in my mind that it will be in a wild sci-fi movie sometime in the near future. All of the drivers will be wearing full crash gear, color coordinated. One must not forget that 3 wheeled vehicles are essentially motorcycles and are very dangerous. Seeing the Aptera in a breaking test do a 180 is a bit scary. Notice the huge rear tire well over a foot wide maybe 18”… it’ enormous! Great for Hollywood and good looks, but it was not used in the tests. Sort of like a body part augmentation common in that neck of the woods. Its performance was the least of the three wheelers. Mainstream Class winner of $5,000,000. Gizmag had good coverage on the “Mainstream Class” winner on Sept 20th. Surprisingly there were no other vehicles in the finals in this class. I totally overlooked the Edison vehicles because they looked like a modern day Piper Cub sans Wings and I felt that the outrigger wheels were exceedingly dangerous This is a catamaran. The thought of a Semi taking out the wheels is an exceedingly terrifying prospect. It seemed to me also that they could have found a muffler that would quiet the hideous noise of the internal combustion engine version that they had and the odor that it produced. 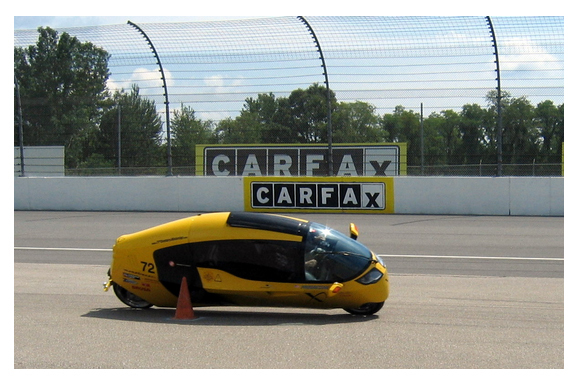 The developer of the Edison Vehicles had it exactly right when he said that it's all about efficiency and that they had the most efficient vehicle of all in terms of weight and aerodynamics, except for the X-Tracer. He forgot to mention the Li-Ion. EFFICIENCY is everything in the engineering world and that even applies to Wind Power. There were some comments about its esthetics which I feel were off point. The vehicle is handsome and relatively nicely designed. The fit and finish may be off but that would be easily corrected in production but one wonders if the basic design approach could have led to enclosing the wheels within the basic body shell. Surely the Li-Ion dispels the notion that frontal area is vitally important. Another interesting thing about the Edison vehicles is that they had a nice, wide wheelbase which meant that from a road dynamics perspective they would be very safe. Had they chosen to use 8 wheels they would have performed even better by greatly reducing the rolling resistance. I make this statement based upon the teachings and demonstrative model tests of Bill Allison, one of the all-time leading suspension designers in the Automotive Industry. More wheels mean less rolling resistance as rail cars have always shown. I really don't believe that this design hold much for the existing auto companies. They would reject it completely for a number of reasons, one of them being safety and the other being Governmental Standards. It's the slick modern day piper cub approach. One almost expects to see a wing kit and a pusher propeller kit. But we must give the sole survivor of the mainstream class its due. While it may have a side by side seating arrangement, it does look awfully cramped. This Car out of Seattle is designed with the concept of being half the width of a normal vehicle. It is frighteningly skinny but the developers theorized that 2 side by side in a standard one highway lane could accommodate twice as much traffic in the same amount of space. It looks frighteningly unstable but I was told that there was a thick plate of steel on the bottom for ballast. Still, I would not care to be in one when it flipped regardless of the impetus. This entry came from Thailand and was designed by an Australian Automotive engineer. It came with a lengthy presentation on the situation of automotive safety in developing countries. Apparently the highway related death count is astronomical in some locations… totally unacceptable. It seems that the upwardly mobile have absolutely no respect for the pedestrian. Interesting to note that in the US the death count has been dropping dramatically and it was announced last month that our automobile related fatalities have dropped below the level in 1950. Obviously focusing upon a problem leads to good solutions. The notion here is that a soft car would obviate that. As a bonus, it floats! 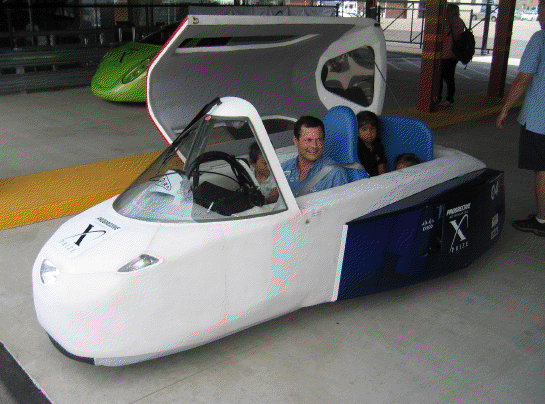 In this case the car is made of Styrofoam and is driven by a motor cycle engine powering one of the rear wheels. Seeing it on the track is surprising because it accelerated very quickly and braked quickly as well. All in all this was a fine competition, underplayed, under reported but very significant. Seeing and riding in the X-Tracer was a thrill, especially on a turn. This team was the most together of all and that, of course, is because of the long time taken in development and production. It is too bad that it is so expensive which mass production would quickly cure. The Li-ion was a sleeper to me and one must give it great kudos and some very hard looks. You might not like its presence but in the hands of a deft designer it could become exceedingly appealing. 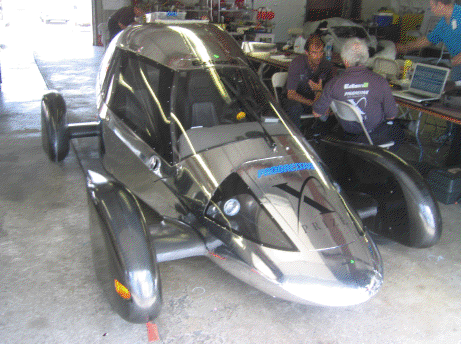 The Raceabout was thoroughly competent by a very competent team. Seeing it on the track, it just looks right. Others were interesting in their approaches, exploring unimaginable possibilities and actually doing somewhat well. 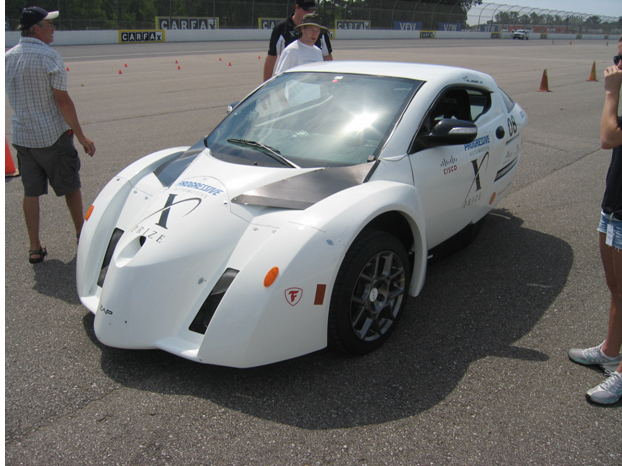 The Progressive Insurance Automotive X-Prize Competition was a great event.